An Ellesmere bride-to-be is on a mission to find the perfect wedding shoes - for her size-15 feet. Julie Felton has searched everywhere for her dream pair with no luck. The 49-year-old even considered having shoes made for the special occasion but cannot afford the £1,000 price tag. Julie, who is 6ft 5in, said: “As far as I know I must have the biggest of any woman in the country. “Someone, somewhere might have a bright idea of how I can get a beautiful pair of wedding shoes without paying a small fortune. Julie, who is a pharmacy technician at the Royal Shrewsbury Hospital, usually wears men’s shoes. She had a growth disorder as a child, which also affected her feet which measure 12 inches (30.48cm). The divorcee had a pair of court shoes made especially for her first wedding 24 years ago. However after her big day, Julie dyed them black. Unfortunately after looking around to get another pair made especially this time round, she was told they would cost over £1,000. 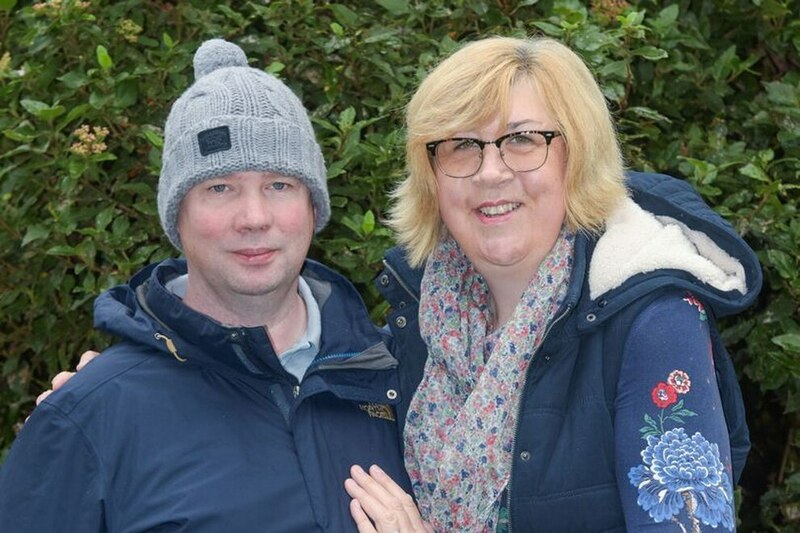 But Julie is determined to hunt down her dream shoes when she marries storeman Steve Evans, 44, in April. Speaking ahead of the big day, 6ft 3in Steve said: “I can’t wait.